David Nieper has been designing and manufacturing luxury nightwear and classic ladieswear in Derbyshire for over 50 years. 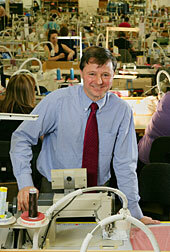 A family firm, David Nieper is fiercely committed to UK fashion manufacturing and all its garments are Made in Britain. Exporting, manufacturing and other business issues. Joining the family business in 1986, Christopher witnessed the huge migration of British fashion manufacturing to offshore production. Choosing to go against this offshoring trend and remain steadfast in the company’s commitment to Made in Britain, Christopher has pioneered the company’s investment in marketing, new manufacturing infrastructure and skills to deliver continuous and sustainable growth. Today, David Nieper enjoys record sales of its luxury womenswear and employs 230 people. Before joining David Nieper, Christopher completed a degree in mechanical engineering, started his own furniture repair business and sailed across the Atlantic. A beekeeper, school governor, and former non-executive director of Help the Aged, Christopher is married with four children and lives in rural Derbyshire.